Outsider art is a type of art created by people who are not formally trained artistically, and often have some degree of mental disorder. The work by outsider artists is usually emotional, loose and has a child-like quality. However, outsider artists are facing several severe problems that keep them “outside” of the mainstream art scene, and not able to have a bigger group of viewers. 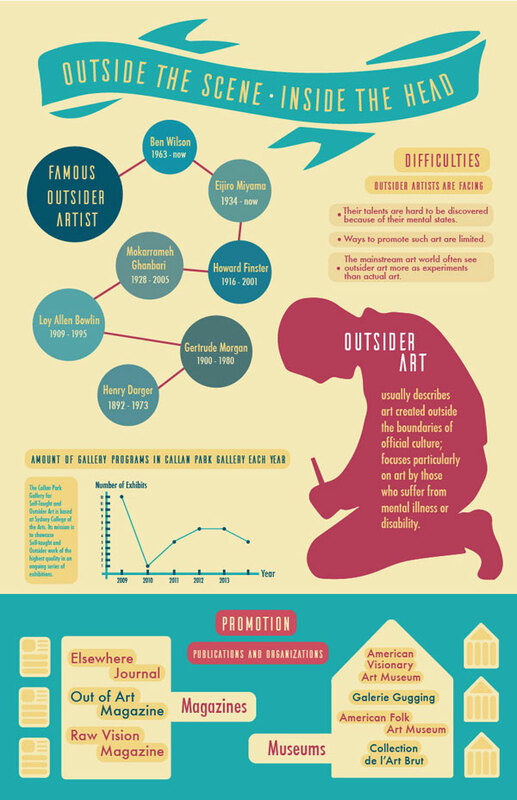 The infographic I made introduces the concept of outsider art, some representatives of outsider artists, the main difficulties they are facing right now, and some publications that are working on promoting such type of art. Xuege Li, born and raised in Zhengzhou, China, and is now a student in PrattMWP. She is a Communications Design major with a concentration in Graphic Design. With a passion in design, Xuege also holds great interests in art, music and film. She plays multiple instruments, and has participated in creating several films including experimental short films and full-length independent documentaries as the cinematographer. She tends to push herself in a direction that is often naive, sincere and abstract.